- Used natives to bring furs to posts and forts in exchange of food, alcohol, weaponry, guns etc.. The Hudsons Bay company is the oldest commercial corporation in North America, and one of the oldest in the world. It controlled the fur trade throughout much of British-controlled North America for several centuries. The traders of HBC started their trade with the Natives of North America, often trading European items such as weaponry and Alcohol in exchange for furs, which were used as items of fashion. 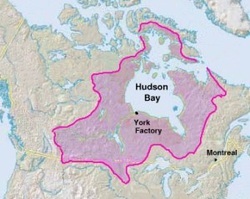 The Hudson's Bay Company owned the rights of land to all the rivers that flowed to the Hudson's Bay. It therefore owned monopoly of Rupert's land, which was the Hudsons Bay drainage system.